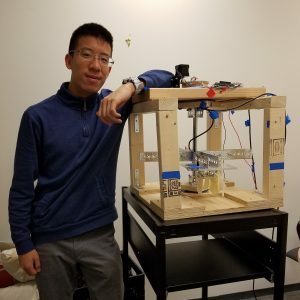 Albert Kyi is entering the 11th grade this fall at Grace Church High School in New York City, NY, and has demonstrated a passion for innovation and sustainability far beyond his age. His desire to find solutions that address climate change started in 4th grade when he was part of a team that tried to cut down on the school’s energy usage. Since then, Kyi has been actively learning about technologies that reduce carbon emissions and the effects of climate change. Kyi’s journey building a Direct Air Capture (DAC) machine began last year during 10th grade, when students were given a budget and six months to complete a big project. Kyi knew he wanted to do something related to climate change. Inspired by his dean Mr. Reilly, who told his students to always “dream big,” Kyi wanted to create a technology that could slow down global warming. When he came across DAC technology through his online research, he knew it would be perfect for his project, so he contacted Dr. Klaus Lackner and Mr. Allen Wright. Lackner directs the Center for Negative Carbon Emissions and is a professor at the Ira A. Fulton Schools of Engineering. Wright is the Executive Director of the Center for Negative Carbon Emissions. He is also an appointed Senior Sustainability Scientist with the Julie Ann Wrigley Global Institute of Sustainability. They have been collaborating to develop the next generation of carbon management technologies and demonstrated a moisture swing sorbent cycle for capturing carbon dioxide (CO2) from the air. Both impressed and fascinated with Kyi’s interest in learning more about DAC and direct air capture with carbon storage (DACCS), they were more than happy to assist with his science project. How was your conversation with Klaus Lackner and Allen Wright? What did you learn, and what inspired you? For more info on Kyi's project, take a look at his DAC brochure.